Among these demands, the Biofabrication has consistant increasing contribution in the huge biomedical research and clinical applications. 6. Diseased tissue and oganisim models, etc. 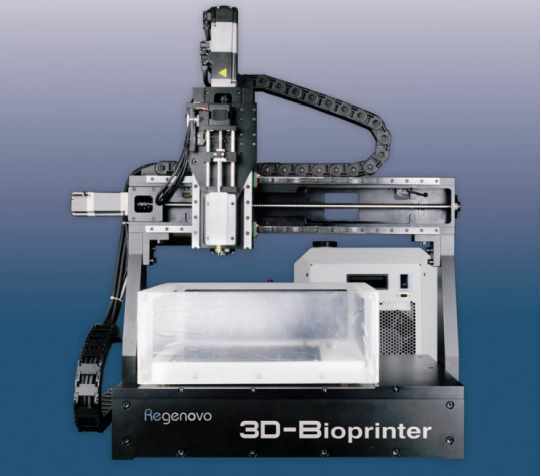 To achieve a realistic time frame for building organized clinically-relevant sizes biofabrication constructs, we Regenovo_ABDC) have extensive emphasis on the Robotic Dispensing Bioprinter, among others types of bioprinters(as that of the stereolithography (light-curing), electrospinning, laser induced forward transfer, inkjet modules that we could include as addition modules), is the most promising bio-printer both for spatial resolution, print speed, material and cost considerations. Base on these key considerations and demands for our bioprinters , we have continous efforts to improve resolution, stability, flexibility and most affordable cost for researchers and clinical developers. 1. Viable cells/biomaterial 3D printing, most cell survival ratio, much cell than 90%, for longest survival of 4 months, , with global technology leading levels for the living cells printing. Based on Robotic dispensing, printable materials are "Unrestricted", as solution, slurry, gel or melt, etc., with high freedom of choices. Using an independent solid state cooling elements, and by the liquid heat transfer medium and micro-flow channel network, to realize the thermal conductivity and temperature control for the print stage and nozzle. The system is highly integrated with precise temperature control, easy extention and operation. Multi-nozzles can be manually or automatically loaded/exchanged for interleaved 3D, multi-material heterogenously located, and multi-layer, multi process steps constructions. High-temperature nozzle temperature range 50-260 ℃, low temperature nozzle range for -5-65℃, can be used to print biological materials that could be melt in between -5 ℃ to 260 ℃ or in semi-fluid state. The High-temperature nozzle is manufactured by integrally molded 3D printing technology(SLS), with the optimal design of the heat exchange efficiency, and supports the molten state biological material printing from 50 ℃ to 260 ℃. The Low temperature nozzle can cover -5 ℃(-20 ℃ option) to 65 ℃ precise temperature control, specially oriented low temperature print way to ensure the vitally active state of soft tissue biomaterials. The pneumatic extrusion nozzle type may have least or have no material leakage while the extrusion is paused or the position is shifted. The screw extruder nozzle type can produce high extrusion propulsion power, that is suitable for extrusion of high pressure tolerance and viscosity materials. 4. 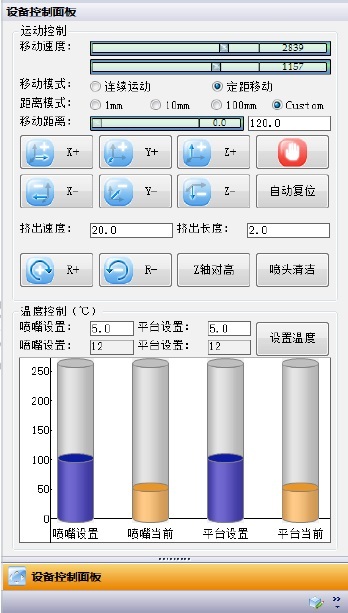 The precise temperature control: Localized temperature control with accuracy of +/- 0.1 ℃, ensuring a constant temperature and cell activity and can realize best spatial repeatability and process reproducibility of the bio-fabrication. 5. Precise controllable internal porosity and ways to print with multiple angles, ensuring that the internal holes of the porous structure are 100% connected, providing similarity as in vivo cell growth microenvironment. The overall structure and materials of the 3D printing system are sterile design to ensure a clean working environment and processes, and are suitable for 3D printing of biological materials and cells under sterile conditions. Integrated supported professional sterile equipment, ensuring chance of contamination is less than 10%. Large molding range, 160 x 160 x 150mm. with custom range available. Implement features such as view, rotate, scale, move and mirror of 3D model, 3D model slicing, and motion stage and 3D model printing controls, etc. Free design with CAD softwares, have external shape and internal structure according to the model implementation requirements. Integrated developed by Regenovo Biotechnology Co.Ltd. 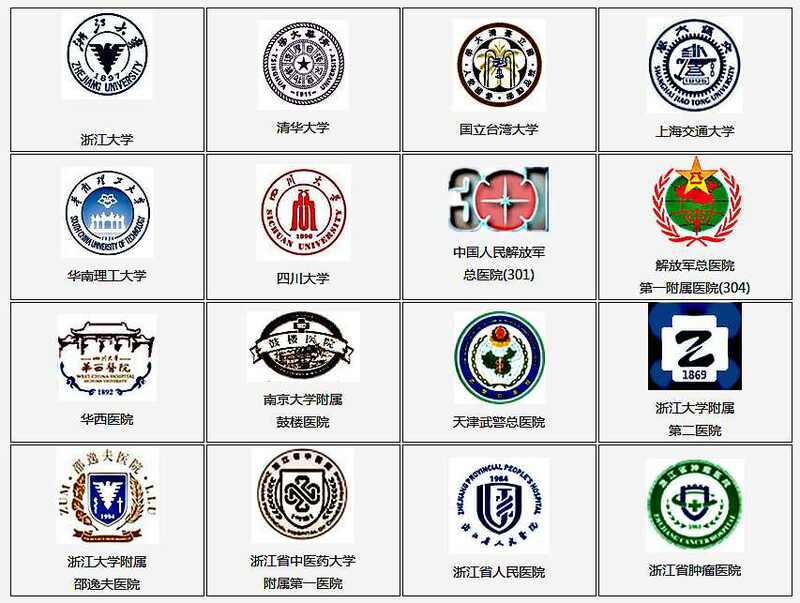 and Hangzhou University of Electronic Science and Technology, with completely independent intellectual property rights, and can implement partial customization according to specific user requirements to realize adjustable and diverse needs. 10. Solid Living Cell Print foundation: Professor Xu Mingen, our chief scientist and colleagues have dedicated in Cell-Printing for more than 8 years, and have prominent contributions in the bio-3D Print field. Data format: direct support for STL, GCODE, and customized proprietary format. a.Lab & manufacturing process optimization. b.Additional modules, as : Stereolithography (Light-Curing), Electrospinning, Laser induced forward transfer modules,etc. Based on progressive and open main frame, we have vigorous and intensive cooperations with our partners and power users in many advanced institutions, for instrument optimization, integrated process optimization, bio-material conditioning and tuning, to advanced bio-print and bio-fabrication projects and goals. We (Regenovo_ABDC) are a global technology and markiting partners, and cooperate seamlessly with research institutions, industry, universities, users for practical demands and successfully developed 3D-BioPrinting systems with independent intellectual properties and provide our users with flexible advantages, as expansion, modification, and innovative R&D applications. Welcome to correspond for discussing your current demand and future developments. 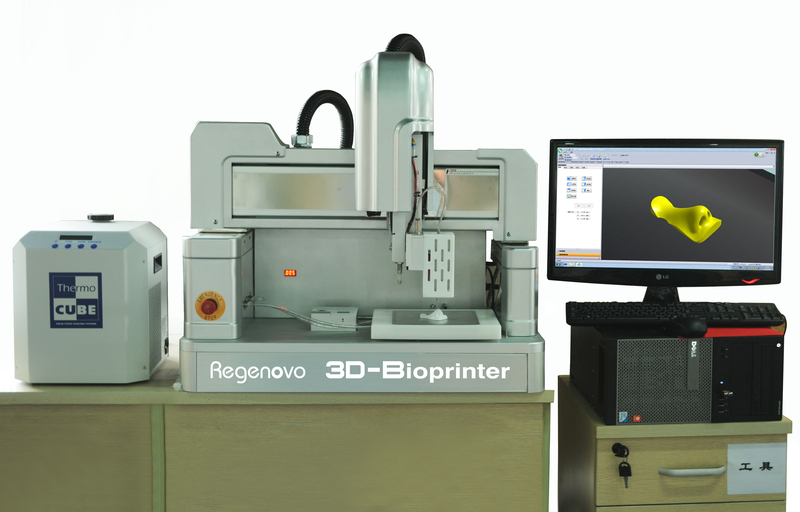 The Regenovo is a high-tech enterprises specialized to provide integrated 3D Bio-Printing technology solutions in the biomedical field, and committed to the development of Bio-Printers bio-materials and software in the biomedical fields, with core research and development technologies. We (ABDC) have more than 20 years continuous efforts in the research and production of lab instrument, software and hardware, and have experiences on the 3D bio and food printing technology. The Shining 3D Technology(Shining), is the largest 3D scanning and printing-related product development and distribution company, and also is one of the major technical partner of Regenovo. 2. Organ printing: fiction or science. Biorheology. 2004;41(3-4):371-5. 4. A three-dimensional in vitro ovarian cancer coculture model using a high-throughput cell patterning platform. Biotechnol. J. 6, 204–212 (2011). 6. Effects of dispensing pressure and nozzle diameter on cell survival from solid freeform fabrication-based direct cell writing. Tissue Eng. Part A 14, 41–48 (2008). 7. Evaluation of hydrogels for bio-printing applications. J. Biomed. Mater. Res. A 101, 272–284 (2013). 8. 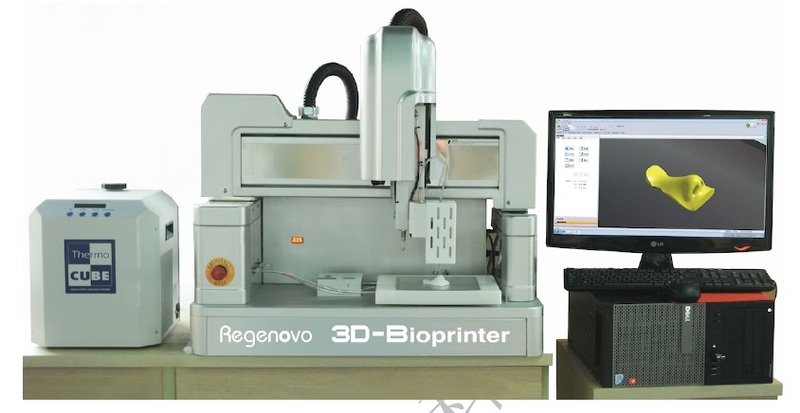 Bio rapid prototyping by extruding/aspirating/refilling thermoreversible hydrogel. Biofabrication 2, 014108 (2010). 11. Microfluidic direct writer with integrated declogging mechanism for fabricating cell-laden hydrogel constructs. 12.Overview of the matrisome–an inventory of extracellular matrix constituents and functions. Cold Spring Harb. Perspect. Biol. 4, a004903 (2012). 13. Decellularization methods of porcine kidneys for whole organ engineering using a high-throughput system. Biomaterials 33, 7756–7764 (2012). 14. Rapid casting of patterned vascular networks for perfusable engineered three-dimensional tissues. Nat. Mater. 11, 768–774 (2012). 15. Purpose-driven biomaterials research in liver-tissue engineering. Trends Biotechnol. 29, 110–118 (2011). 16. On the mechanisms of biocompatibility. Biomaterials 29, 2941–2953 (2008). 17. Current progress in inorganic artificial biomaterials. J. Artif. Organs 14, 163–170 (2011). 18. Hydrogels for the repair of articular cartilage defects. Tissue Eng. Part B Rev. 17, 281–299 (2011). 19. Cell encapsulation using biopolymer gels for regenerative medicine. Biotechnol. Lett. 32, 733–742 (2010). 20. In vivo bioprinting for computer- and robotic-assisted medical intervention: preliminary study in mice. Biofabrication 2, 014101 (2010). 21. Laser printing of skin cells and human stem cells. Tissue Eng. Part C Methods 16, 847–854 (2010). 22. Survival and proliferative ability of various living cell types after laser-induced forward transfer. Tissue Eng. 11, 1817–1823 (2005). 23. Laser-assisted cell printing: principle, physical parameters versus cell fate and perspectives in tissue engineering. Nanomedicine 5, 507–515 (2010). 24. Directed three-dimensional patterning of self-assembled peptide fibrils. Nano Lett. 8, 538–543 (2008). 25. Direct cell writing of 3D microorgan for in vitro pharmacokinetic model. Tissue Eng. Part C Methods 14, 157–166 (2008). 26. Scaffold-free vascular tissue engineering using bioprinting. Biomaterials 30, 5910–5917 (2009). 27. 3D bioprinting of heterogeneous aortic valve conduits with alginate/gelatin hydrogels. J. Biomed. Mater. Res. A 101, 1255–1264 (2013). 28. Toward engineering functional organ modules by additive manufacturing. Biofabrication 4, 022001 (2012). 29. Characterizing environmental factors that impact the viability of tissue-engineered constructs fabricated by a direct-write bioassembly tool. Tissue Eng. 13, 373–383 (2007). 30. Gelatin-methacrylamide hydrogels as potential biomaterials for fabrication of tissue-engineered cartilage constructs. Macromol. Biosci. 13, 551–561 (2013). 31. Biofabrication of multi-material anatomically shaped tissue constructs. Biofabrication 5, 035007 (2013). 32. Hybrid printing of mechanically and biologically improved constructs for cartilage tissue engineering applications. Biofabrication 5, 015001 (2013). 33. 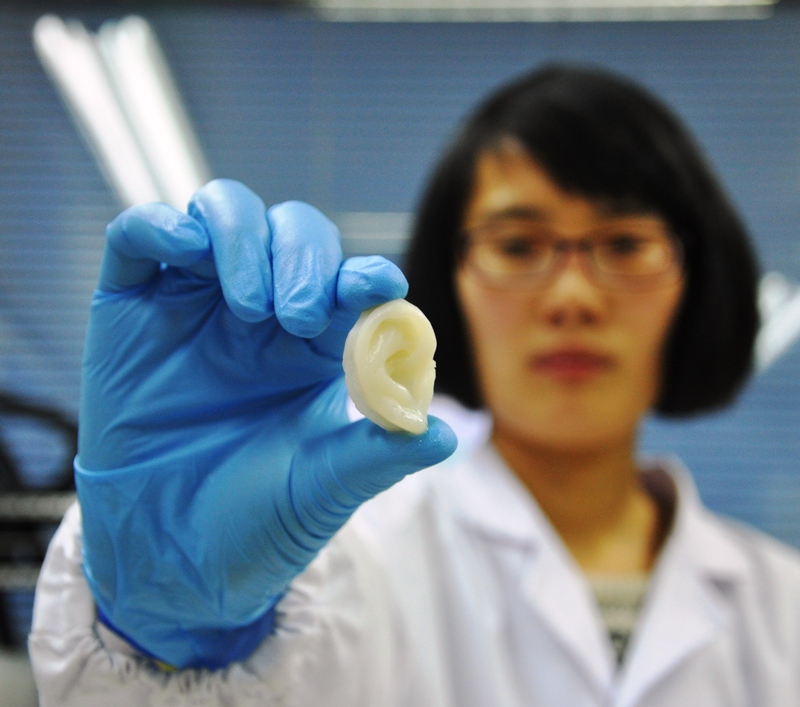 Direct human cartilage repair using three-dimensional bioprinting technology. Tissue Eng. Part A 18, 1304–1312 (2012). 34. Bioprinted amniotic fluid-derived stem cells accelerate healing of large skin wounds. Stem Cells Transl. Med. 1, 792–802 (2012). 35. 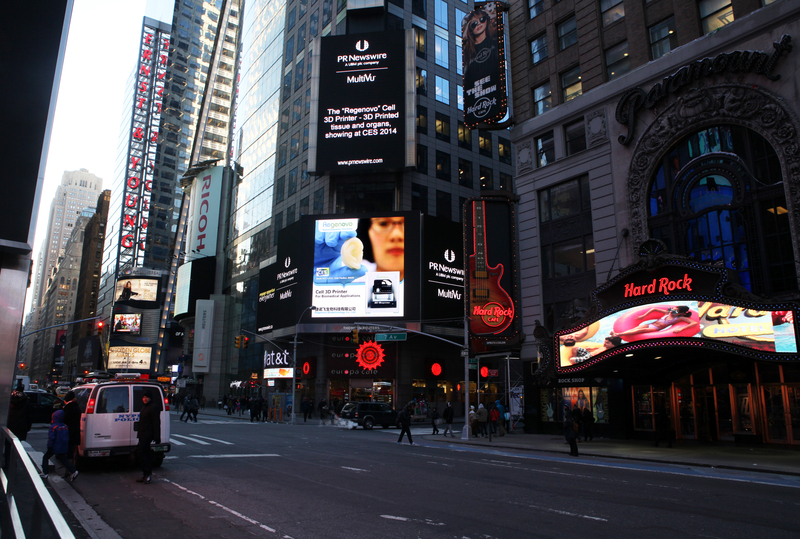 Organic transistors manufactured using inkjet technology with subfemtoliter accuracy. Proc. Natl. Acad. Sci. USA 105, 4976–4980 (2008). 36. Engineered spatial patterns of FGF-2 immobilized on fibrin direct cell organization. Biomaterials 26, 6762–6770 (2005). 37. Bioprinting vessel-like constructs using hyaluronan hydrogels crosslinked with tetrahedral polyethylene glycol tetracrylates. Biomaterials 31, 6173–6181 (2010). 38. Novel crosslinking methods to design hydrogels. Adv. Drug Deliv. Rev. 54, 13–36 (2002). 39. Bioprinting for stem cell research. Trends Biotechnol. 31, 10–19 (2013). 41. Complex heterogeneous tissue constructs containing multiple cell types prepared by inkjet printing technology. 45. In vitro vascularization of a combined system based on a 3D printing technique. J. Tissue Eng. Regen. Med. (SCI), DOI: 10.1002/term.1863, 2014. 46. Rapid Prototyping of a hybrid hierarchical polyurethane-cell/hydrogel onstruct for regenerative medicine. Mater. Sci. Eng. C (SCI), 2013;33:3220-3229. 47. Preparation of an adipose-derived stem cell/fibrin- poly(DL-lactic-co-glycolic acid) construct based on a rapid prototyping technique. J. Bioact. Compat. Polym. (SCI), 2013;28(3):191-203. 48. Optimizing the fabrication processes for manufacturing a hybrid hierarchical polyurethane-cell/hydrogel construct. J. Bioact. Compat. Polym. (SCI), 2013;28(4):303-319. Applications in Biomedicine. INTECH (www.intechopen.com), 2013;111-155. 50. The integrations of biomaterials and rapid prototyping techniques for intelligent manufacturing of complex organs. In: Lazinica R, ed. Advances in Biomaterials Science and Applications in Biomedicine. INTECH (www.intechopen.com), 2013;437-463. 51. Intelligent freeform manufacturing of complex organs. Artificial Organs (SCI), 2012;36: 951-961. 52. Overview on “Chinese-Finnish workshop on biomanufacturing and evaluation techniques”. Artificial Organs (SCI), 2011, 35, E191- E193. 53. Gelatin-based hydrogels for controlled cell assembly. In: Ottenbrite RM, ed. Biomedical Applications of Hydrogels Handbook. New York: Springer, 2010, 269-284. 93. Organ printing: fiction or science. 113. Fluid shear stress modulates surface expression of adhesion molecules by endothelial cells. 183. Why are double network hydrogels so tough?